Your message in print is something your audience can touch, feel, and even smell in some instances. It creates a physical interaction between you and your audience, as they open it, turn the pages, or remove a special offer or mail-in response. Communicating in print has an implied level of credibility to the recipient. The investment made by you to convey your message in print means that it has value. In many ways, a direct mail campaign is like a digital advertising campaign. Reach targeted segments of your market their interests, income, or many other audience demographics. Consumers (even millennials) continue to retain a higher level of interest in printed material. They read at a rate as much as 30% higher versus digital text. It increases the chance that your message will be read, understood, and better yet, not diluted by off-topic comments or other advertising in the sidebar. Communicating in print has a “stickiness factor”. 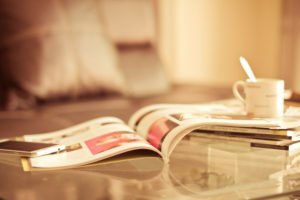 Research in neuromarketing reveals that print has a much higher retention rate than digital content. Another finding is that your message is more persuasive. Your audience can only respond if they remember that you’re a purchase option. Print is voluntary, so your message never interrupts or intrudes on your intended audience. Digital, TV and radio advertising is often an obstacle to get to the intended content. Your message in print is an invitation to be viewed when your audience on their terms. Today’s print production processes and materials are renewable and recyclable. Sustainability standards for paper production, the availability of post-consumer paper and water-based inks means that the message you convey in print is a responsible one. An online presence and social proof should be a consistent element of your marketing strategy. Print is a cost-effective channel for enhancing your digital brand and increasing your market share. Speak to your audience in their language. It reinforces the connection you have with your audience and multiplies your reach. Printed content also has the added advantage of communicating multiple languages simultaneously. Print goes well beyond height, width, and depth. Shapes, textures, colors and high-quality images add dimensionality to your message that goes well beyond it being viewed on a screen. QR codes and targeting landing pages give you the metrics you need to measure your ROI. A direct mail campaign with message subsets gives you the insight to refine and adjust your message for a higher response rate. Print is an excellent channel for pointing your market to your digital presence. QR codes and personalized landing pages seamlessly transport your audience to highly targeted information offerings. It’s likely that we can help you with your next print marketing project in a tangible, credible, engaging and personal way–for starters. Let’s talk.